This list includes everyone who appears to be an adult resident or property-holder in Winslow. It has been compiled manually so there may be errors! Names may occur more than once on a page. 1556S refers to the Survey of the Manor in 1556, published in D. Noy, Winslow in 1556 (Buckinghamshire Archaeological Society, 2013). 1641PT refers to the Poll Tax of 1641, available on a CD from the Bucks Family History Society. 1700WH = Winslow Hall accounts published in Records of Bucks 1926. BRS5 = Bucks Archaeological Society documents listed in Bucks Record Society vol.5 (available from their website), now at the Centre for Bucks Studies. The 1876 and 1939 directories have not yet been indexed, nor the lists of wills proved at St Albans and the PCC. 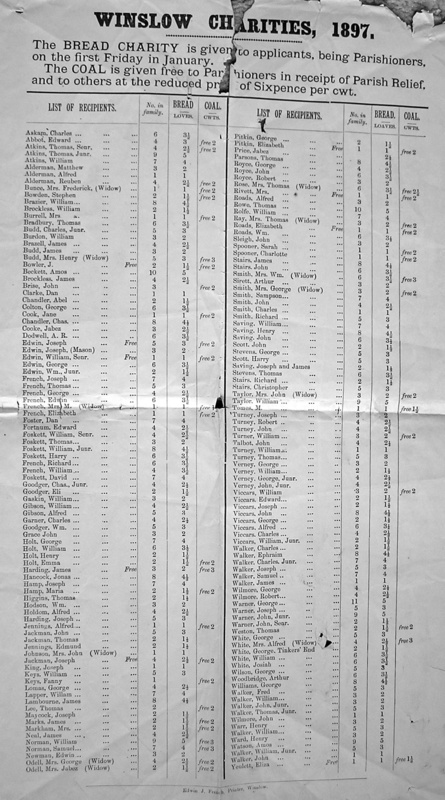 For the Workhouse censuses, only people with another connection to Winslow have been indexed. The years listed may refer to when someone is mentioned in a document, rather than when they were alive. WATTS Henry (Mr) 1518-24, 1524, 1528, 1532, 1538, 1547?